Profits at the more than 4,800 U.S. community hospitals continued their steady rise last year, hitting $76.1 billion, a 43% increase since 2011. Total net revenue reached $979 billion in 2016—including nursing home results—and expenses were $903 billion, according to the 2018 edition of the American Hospital Association's Hospital Statistics report aggregating hospital financial and utilization trends, which was released Thursday. Hospitals' overall operating margin was 7.7% in 2016, compared with 7.9% in 2015. The annual report includes data on all 4,840 registered community hospitals in the U.S.—159 fewer than in 2012. But data from consulting firm Deloitte show that around the same time, between 20% and 30% of hospitals experienced negative operating margins, revealing a significant divide between hospitals that are faring well and those struggling to stay afloat. "If you drilled down and disaggregated the numbers, you'd see a lot of unevenness between the hospitals that are doing well and are being able to figure out how to generate profits and those that are struggling and in fact have closed," said Mary Crossley, a professor in the University of Pittsburgh School of Law who focuses on healthcare finance and delivery. While collective profits climbed in 2016, operating margins held relatively steady. Meanwhile, hospitals' total uncompensated care, which includes free and discounted care for low-income patients plus bills that went unpaid, rose to $38.3 billion in 2016 from $35.7 billion in 2015, according to AHA data. Ashley Thompson, the AHA's senior vice president for policy analysis, said the change is likely because more patients with high-deductible health plans are unable to pay their hospital bills. As a percentage of total expenses, however, the cost of uncompensated care was unchanged between the two years, standing at 4.2%. That follows significant declines in uncompensated care after the 2014 implementation of the Affordable Care Act, which expanded healthcare coverage through Medicaid and subsidized private plans, reducing the number of patients who needed help paying bills. 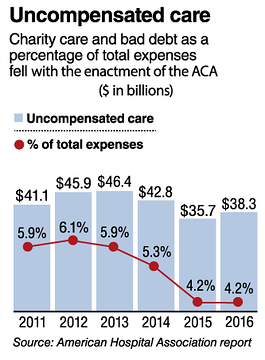 Uncompensated care hit a peak of $46.4 billion in 2013. That number dropped to $42.8 billion in 2014 and to $35.7 billion in 2015. Inpatient admissions, including nursing home units, increased slightly in 2016 to 33.4 million, about 164,000 visits higher than in 2015 and up 358,000 from 2014. Inpatient admissions fell about 5% from 2011 to 2014 before inching up again. Outpatient visits, by contrast, have been consistently on the upswing since at least 2011. Health systems recorded 747 million outpatient visits in 2016, up 12% from 656 million in 2011. Steve Burrill, U.S. healthcare provider leader and vice chairman with the consulting firm Deloitte, said those numbers illustrate the move away from fee-for-service spending in healthcare toward value-based care, which he said is largely driven by the Medicare Access and CHIP Reauthorization Act of 2015. Hospitals are getting better at promoting wellness and preventing illness, so fewer people wind up requiring inpatient care, he said. The fluctuations in inpatient admissions likely also correlate with implementation of government programs that penalize unnecessary readmissions, Crossley said. Some hospitals may have found ways to avoid those penalties by effectively managing their admission practices. "It could reflect an increased ability over time to kind of optimize the mix, so that they are keeping out the patients for whom they won't get reimbursed or whose readmission will hurt them in the long run, while being able to figure out, 'OK, these are the patients for whom inpatient admission is necessary and reimbursable,'??" Crossley said. At the same time, hospitals tend to make more money on expensive inpatient procedures compared with simpler outpatient procedures. For rural hospitals, the increases in outpatient utilization haven't been enough to offset the inpatient losses, said Brock Slabach, senior vice president of the National Rural Health Association. Of the 159 fewer hospitals noted by the AHA, 155 are classified as rural and four as urban, indicating that rural hospitals are closing at a much faster clip. Slabach said his organization's data show that 44% of rural hospitals operated at a negative margin in 2016, up from 41% in 2015. That's partly because rural hospitals tend to rely more on Medicare than their urban counterparts. 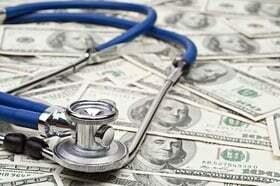 The program pays less than commercial insurance. "There have been some urban closures," Slabach said. "I'm not going to suggest that there haven't been any. But they've not been at the rate that they have been in rural."